Driver Robot updates all of your system drivers in just 2 minutes. With Driver Robot, you never need to worry about installing an incorrect or out-of-date driver - the Driver Robot scan and database ensures you always get the latest official driver. Because Driver Robot supports such a massive breadth of devices, Driver Robot is the best way to get driver updates for your machine. Driver Robot's database contains over 100,000 hardware devices. 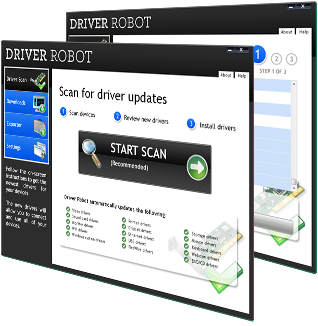 ...... Driver Robot's massive database, perfect scan, and guaranteed driver availability means that you only have to press one button to download all of the correct drivers for your system. Driver Robot update your system automatically. - Huge database: The world's largest driver database, Driver Robot's online database has the latest official drivers for over 100,000 devices. Constant database updates. only Driver Robot has a driver database that is constantly updated by the Driver Robot spider. - Guaranteed driver availability: The Driver Robot servers mirror all manufacturer drivers - so you can download drivers even when the manufacturer's website is down. - Offline driver analysis: Need a driver for a computer that's offline? Use the Driver Robot Exporter to export your hardware analysis to an online PC. Qweas is providing links to Driver Robot 2011 as a courtesy, and makes no representations regarding Driver Robot or any other applications or any information related thereto. Any questions, complaints or claims regarding this application Driver Robot 2011 must be directed to the appropriate software vendor. You may click the publisher link of Driver Robot on the top of this page to get more details about the vendor.